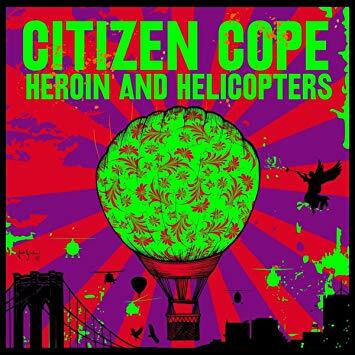 Clarence Greenwood best know as, Citizen Cope had gone on a little creation hiatus, “Heroin and Helicopters” will be his first original release in almost seven years and as a fan of his I’m beyond excited to hear the album. The first time I heard Citizen Cope was off an Easy All Stars Album, he did a cover of Karma Police. I was sitting in a chair at my friends at her college home and luckily for me at the time, her boyfriend had great music taste. We went out to DC that night and some how I thought it was the perfect time to digest LSD but if I didn’t would I have appreciated that song so much, it saved me that night and his voice always has a beautiful haunting feeling about it. That started my love for Citizen Cope. So far two singles have been released off of the album. “Justice” & “The River”. Both tracks appeasing different emotions but my favorite of the two that’s been on repeat as of recently on my Spotify is “The River”. The track is about the downs and outs in life but some how grant you the gift to hold on tight and look in the beauty of the downfall. The message of hope and love with Copes warm caring vocals make the song that much better. The album brings us 11 brand-new tracks. Word on the street is that while in the stuido, he has finished enough tracks for two albums. So we can assume that we won’t have to wait another seven years for new music. But with that said, perfection can’t be rushed, so take as much time as you need. With the release of Citizen Copes most anticipated album to date comes a full band tour, yes, you heard that correctly. Full-Band tour. Citizen Cope has been touring over the years but just acoustically, but this year it will be with a full band. BEYOND excited I am to see him with a backing band. Citizen Cope is an artist, a musician, as well a producer. Most if not all of his songs are formed with an acoustic guitar, so seeing him with the guitar and being more intimate is a great time but let’s be honest, bringing the whole kitchen sink with you makes it a little easier to groove to. Though I won’t be upset if he comes and does one or two acoustic songs on stage to give those fans who enjoy the intimate aspect a little piece of it. Citizen Cope is working with the guys over at Ineffable Music Group for this release and let’s just say he couldn’t have chose a better group to be a part of. They are on top of their game, treat their artist great and the most important aspect of them is they are fans of all the artist they support. So wishing them all continued success for the release and beyond in their future endeavors. As most of you know I’m a huge Stick Figure fan. I was scrolling thru Facebook last week to see a live feed of a picture of Citizen Cope with Scott Woodruff, the brains behind the operation of Stick Figure at their studio “Great Stone Studios” So maybe they are working on a song together because that would be glorious. But nothing official has been said yet. I will be asking either Woodruff or Cope about this whomever I see first. If they’re willing to talk to me.